Group of flowers ultimately originating from a single stalk or axil. Stalk terminating in a single flower. Stalk terminating in one or more pedicels. Inflorescence upon which the bottom flowers open first (e.g. gladiolus, foxglove, smithiantha, Diastema racemiferum). Here F = flower, R = raceme, C = cyme. it means 0 or 1 of that unit. On a raceme the lowest pedicels and their associated flowers develop first, followed by the next lowest, and so on. A raceme tends to peter out in one or more buds which don't fully develop. A cyme is a stem terminating in a flowerbud, but which might have, below the flowerbud, a node from which one or two cymes develop. This definition sounds circular (and that is what is meant by the word "recursively" above), but really isn't. After some number of branchings, the stem terminates in a single flowerbud, and there the circularity ("recursion") stops. On a cyme the terminal flowerbud develops first, followed by the terminal flowerbuds of the cyme's node's cymes, followed by the terminal flowerbuds of the cyme's node's cyme's node, ad not quite infinitum. Trust me, look at the branching of a multiflowered stalk on an African violet or streptocarpus, and all will become clear. 0 or 1 of the unit. PF = pair flower. PFC = pair-flowered cyme. **  more than two flowers ([PF] and one or more [PFC] present). without the pair-flower [PF] being present. The best way to get the idea of a cyme (and its pair-flowered variant) is to closely examine a saintpaulia flowerstalk or a multi-flowered streptocarpus flowerstalk. 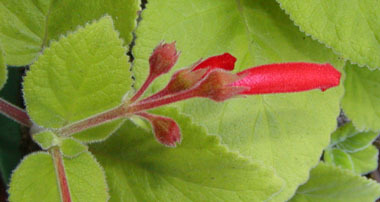 Because the flowerstalks are larger than in other gesneriads, it is easier to make out the structure. It isn't as obvious, but the pair-flowered cyme is the basic inflorescence in Sinningia too. Somewhat ironically, one of the best pictures I have of a pair-flowered sinningia cyme is on a hybrid. This picture of Sinningia reitzii x cardinalis shows the end flower opening first, then the pair flower directly beneath it, and lastly, one on each side, the two still-developing one-flowered "cymes". Another closeup of a pair-flowered cyme can be found on the Sinningia 'Carnival' page. To show that the pair-flowered cyme is a unifying feature of the gesneriad family, here is a picture of a gesneriad from half a world away. This is the pair-flowered cyme of a Lysionotus, from southeast Asia. 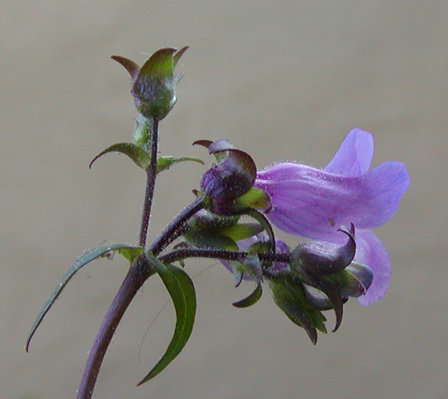 Note that each side flower has a bud beneath it, in the pair-flower position. 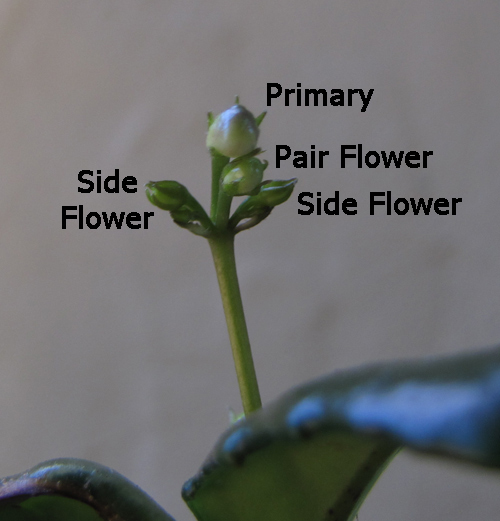 Thus, each "side flower" is actually a secondary pair-flowered cyme. Sinningia eumorpha and Sinningia sp. "Black Hill" normally have one flower per axil. How can one even speak of an inflorescence in that case, with just one flower? As shown on the Black Hill page, a plant of that species sometimes has more than one flower per axil, and when it does have a second flower, it is in the pair-flower position. There is an interesting article by Anton Weber in the one and only issue of Gesneriana on the development of pair-flowered cymes. It has scanning-electron microscopy pictures to show the sequence in which the various flowers and bracts are initiated and their position on the inflorescence bud. Two of the species used in his investigation are sinningias: S. bulbosa and S. lineata. Not all sinningias have cymes. In particular, Sinningia defoliata has a raceme. The pair-flowered cyme is the base inflorescence type in the Gesneriaceae. It is found throughout every branch of the family. This is a drastic oversimplification, but there are five general ways in which the flowers can be organized in a sinningia. The first three types below characterize indeterminate growth (no predetermined number of nodes per stem), while the last two characterize determinate growth (predetermined number of nodes per stem). Please note that these are descriptive categories, not developmental ones. I'm not a professional botanist and have no assurance that all sinningias that form (for instance) "platform" inflorescences do so in the same way. Furthermore, inflorescence type does not correspond well to the taxonomy of the genus Sinningia (that is, species with the same inflorescence type are not grouped together in the family tree), so that inflorescence type seems quite mutable during the process of evolution. Strictly speaking, all sinningias have axillary cymes. That is, the flowers are borne on inflorescences which are cymes and originate in the axils of nodes. There are no racemes in Sinningia and no inflorescences which do not originate in axils. In the present context, however, we use the phrase axillary cyme to refer to inflorescences originating from the axils of fully-developed leaves on stems with indeterminate growth. Axillary Cyme: One or more flowers in the axil of a fully-developed leaf. If there are more than one, the flowers are arranged in a pair-flowered cyme. Terminal Peduncle: A cluster of flowers on a peduncle which appears to be more or less a continuation of the primary stem. The peduncle may have bracts where the pedicels or secondary peduncles meet the terminal peduncle. The distinction between this and the Extended Axis is that there is an abrupt shift between vegetative stem and Terminal Peduncle, while the shift to the Extended Axis is gradual. Sinningia lineata [one or more peduncles per stem]. Terminal Cluster: A cluster of flowers sprouting directly from the "crown" of a plant of determinate growth, with only a fixed number of leaves.